« Bamboo flooring. And photos of GCT. I painted some fabric. I love you, Scribbles Shiny 3D Paint in Petunia Purple. My friend B. likes purple. A great deal. It’s his most favoritest color ever. 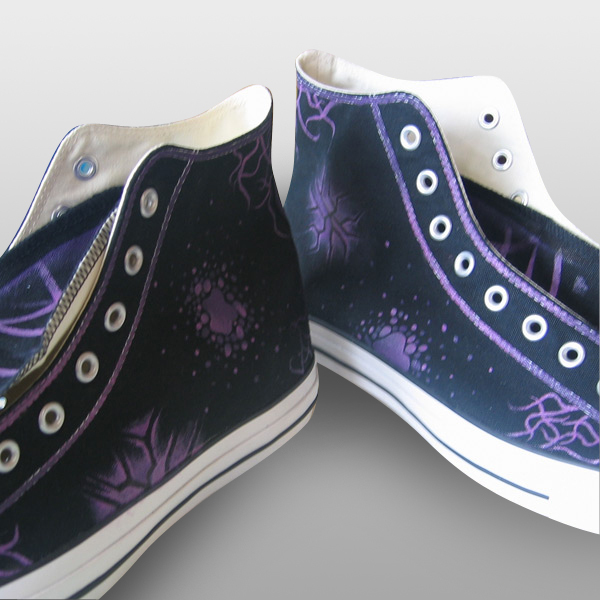 And he has big feet (size 13), so sometimes it is hard for him to find purple shoes. I took pity on his metatarsal plight and bought some Converse Chucks in his size and just JAZZED ’em right up. 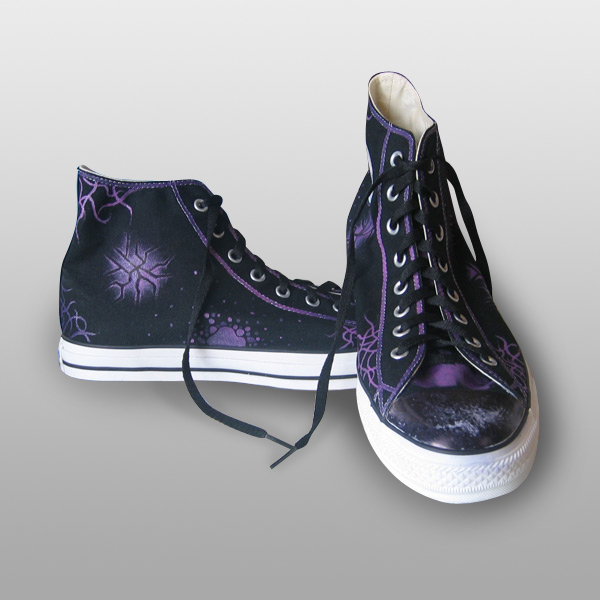 They are so purply and peppy, I’m tempted to buy a pair and craftify them fer m’self. I tried to keep these as masculine as I could, but with mine I could use sparkles! Ah, sparkles. And here is some of the painting in closer detail. JAZZY. 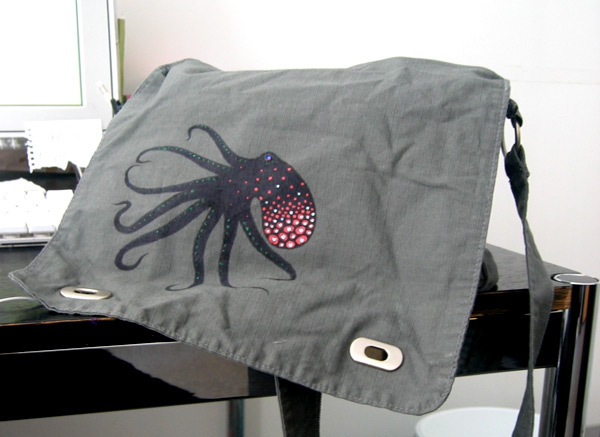 And because my purse with the pomegranate/virus pattern on it started to rip a little, I painted my latest purse with a delightful octopus. He’s black, but his spots are shimmery russet and on top of that are aquamarine rhinestones. EVEN JAZZIER. My kitchen has a big ole piece of Formica-covered plywood next to the fridge, and I think I will make a cloth hanging with octopi and cuttlefish and jellies and other sea-beasties to hang over it so it’s not quite so… plastic-looking. I’m really going to try to make my kitchen more organic. Incorporate some wood and stones, things like that. We’ll see what happens. This entry was posted on Monday, May 12th, 2008 at 8:30 pm and is filed under Apartment, My Art/Design/Business. You can follow any responses to this entry through the RSS 2.0 feed. You can leave a response, or trackback from your own site.